Create tear-off note pads and forms by applying pad adhesive. Pad up to 10,000 sheets at once! 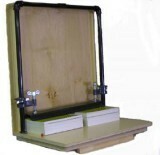 The built-in mobile base and storage shelf allow for easy movement of your pad job and accessories about your shop. Pad two stacks of 5,000 8.5" wide sheets side by side.